In the previous blogs we discussed the Learning Cycle and how this model addresses the process of learning and development both at the individual employee as well as the organizational levels. The next key step in the Learning process that we will examine is how to determine whether the activities / program(s) implemented have had the desired impact (Review & Evaluation). Competencies that have been identified for roles within the organization can serve as the standards or criteria for determining the level of success of learning interventions. This approach is particularly powerful because assessments based on the competencies provide the organization with an indication of the extent to which employee workplace behavior has improved. For example, pre- and post-learning event testing / assessments can be conducted to evaluate the extent of development at both the individual and aggregate level (i.e., all employees who have completed the program). Based on this, the organization can determine whether the learning investments are paying off and, as appropriate, what changes need to be made to address performance gaps. Organizations place a great deal of importance on the learning and development of its employees. In fact, we know of one organization that had to shut down their plant operations because a large percentage of the employees did have the necessary skills / competencies to operate safely and effectively. It is, therefore, important to assess whether the training is achieving the desired impact and outcomes. At the organization level, the value of training / learning can be assessed on a number of levels. Jack Phillips (2012) has detailed a five-level model for assessing learning, ranging from Reaction – Level 1 (e.g., participant reviews completed at the end of training), to demonstrated Learning – Level 2 (e.g., test results at the end of a course), to Application – Level 3 (e.g., uses the learning on the job), to Business Impact – Level 4 (e.g., learning has had a measurable impact on things like productivity and efficiencies), and finally to Return on Investment (ROI) – Level 5 (e.g., learning has had a measurable impact on overall organizational financial performance, such as profits, sales, etc.). As noted in this model, it is possible and sometimes important to measure and evaluate learning from a number of levels and perspectives. The first step is to determine the goals and / or outcomes you hope to achieve through the learning program. In some cases, the organization may be implementing learning solely to improve the quality of working life (e.g., creating a more respectful workplace), and in others there may a large financial imperative (e.g., increasing sales and / or profitability). Regardless, the goals and outcomes for the learning program should be clearly articulated in advance. It then becomes possible to design and implement measurement standards and processes for determining the success of the program. The following diagram provides some illustrative examples of success indicators (green circles) and how they could be measured (arrows leading from circles). Often success indicators (program goals / outcomes) are articulated in ways that cannot be directly measured (e.g., reduced anxiety when dealing with organizational change), so it is important to identify proxy measures, which when used alone or in combination, provide an indication of the extent to which the program has been successful. 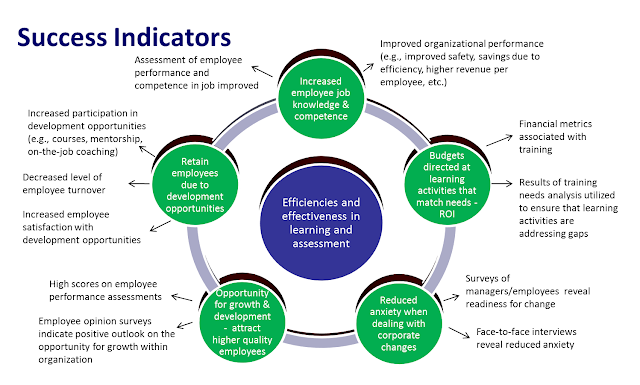 The arrows associated with each of the green circles in the diagram provide some examples of how various goals or success indicators could be measured. The key is to ensure that outcomes or success indicators for the program are clearly indicated in advance and that measurement standards and processes for determining levels of success have been identified, developed and implemented. In this way, HR and Learning professionals will be in a good position to demonstrate whether in fact the intended goals of the program have been accomplished. The next and final blog in this series summarizes some of the best practices in implementing competency-based learning and development. Sign up to our blog’s mailing list through the form on the right-hand side to receive the rest of the series in your inbox.